The Stepper Mid Safety Boot for Women's from Puma Safety includes Steel toe cap protection. Cushioning IQ Cell integrated in the heel area. It's made from breathable textile with FUSE TEC elements and Breath Active lining. Rated to S1P HRO SRC with toe protection to 200 joules impact. The Stepper mid safety boot mid-sole is penetration resistant up to 1100 newtons. The Rio Mid Safety Boot from Puma Safety made with aluminium cap and flexiable FAP midsole. Suede and leather upper includes BreathActive functional lining. Rated for S3 HRO SRC with Toe Protection to 200 joules impact. The Rio Mid Safety Boot have Penetration Resistant Midsole to 1100 Newtons. 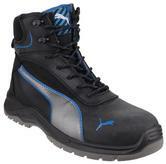 The Daytona Mid Safety Boot from Puma Safety includes composite Cap flexible FAP midsole. It's made from smooth full leather upper and BreathActive functional lining. Penetration Resistant Mid-sole up to 1100 Newtons. The Amsterdam Mid Safety Boot from Puma Safety includesa aluminium cap and flexiable FAP midsole. Toe cap protection and Nubuck leather upper. This boot is made from BreathActive functional lining and Evercushion pro footbed. The Amsterdam Mid Safety Boot includes Penetration Resistant Midsole to 1100 Newtons. 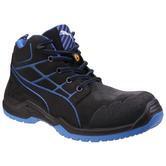 The Borneo Mid Safety Boot from Puma Safety comes with composite cap and steel midsole. Rated to S3 SRC with Toe Protection to 200 joules impact. Borneo Mid safety boot midsole is penetration resistant to 1100 Newtons. 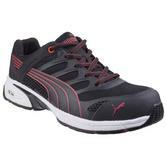 The Cascades Low Safety Shoe from Puma Safety comes with composite Cap and flexible FAP midsole. Made with non-metallic CORDURA and a greased full leather upper. Lining made from Breath Active functional lining Outer material and Greased Leather Sole. Midsole is Penetration Resistant to 1100 Newtons. Waterproof seal to keep your feet dry while you work. Toe bumper guard to help reduce abrasion to your boots. The outsole is heat resistant as well as slip resistant. 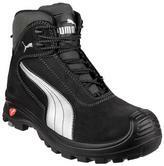 Puma Safety Atomic Mid Safety Boot comes with Water resistant, Abrasion resistant, robust full leather upper. Lace up Safety Boot with anti-static and energy absorbing heel. Impact and compression resistant synthetic toe cap and penetration resistant midsole. Injected lightweight PU midsole - better shock absorption across the whole tread. BreathActive lining provides good moisture management and great breathability. Breathable and flexible Metal Free trainer shoes, provides you with a better breathability and moisture management when work means sweat. Breathable leather and mesh upper, BreathActive functional lining and Padded collar. Antistatic safety shoes with Reflective trims and DuoCell Energy absorbing heel. More comfort with Evercushion BA anatomically designed removable footbed. Composite toe cap protection tested to 200 joules impact and penetration resistant flexible composite midsole plate. Puma Pace Low safety shoes come with Dual Density Rubber outsole with Torsion Control support is resistant to 300°c heat contact, oil, low concentration acids/alkalis and solvent. Puma Safety Fuse TC Trainer with impact and compression resistant steel toe cap. Penetration resistance to 1100 Newtons, Anti-static with an energy absorbing heel. SAFETY KNIT textile upper offers high flexibility and high resistance at work. iCell improves the cushioning while enhancing the shoe's stability and comfort. Extra comfort with microfiber and breathable sandwich mesh upper. SRC - Slip resistance on both steel and ceramic surfaces covered with water and cleaning products. The double density FLEXMOTION PU sole provides a cushioning midsole and ultra flexible outsole. Evercushion BA footbed provides extreme comfort and moisture control. The Rio work shoe by Puma is a protective, comfortable and stylish safety shoe. The ultimate comfort and agility you get Evercushion pro foot-bed and suede leather upper. It features a breathable Sandwich-Mesh. Toe-cap protection makes this shoe suitable for any job. 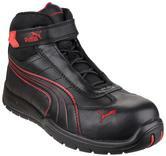 Fuse Motion Black safety shoe from Puma: textile upper with padded collar and tongue. It's features heat-resistant rubber out-sole with perfect flexibility and grip, lightweight EVA mid-sole and Torsion control system which provides excellent support and stability. Duocell shock absorber is used for ultimate performance and maximum comfort. The PUMA Silverstone safety shoe have a Motorsport-inspired look. It offers a durability and comfort. Steel toe cap for impact and compression protection. Safety shoe is anti-static and reduces the accumulation of static electricity. Slip-resistant (Motorsport) rubber out-sole with iCell technology that offers excellent stability and enhances cushioning. The PUMA Fuse Motion safety shoe is a comfortable safety shoe. PUMA's Fuse Motion features a slip resistant rubber outsoles. It features a steel toe cap, static dissipative protection. Heat resistant up to 572° C.
The FUSE.TEC® technology in the flex-zones of the shoe provides comfort and greater durability. This is a lightweight 100% Metal Free, knitted-upper safety shoe that has been designed to close the gap between sports and safety footwear. The upper is produced from a single thread, reducing stitching but still incorporating patterns and designs that would normally be sewn together. Protective composite toe cap and Puncture resistant composite midsole for underfoot protection. BreathActive functional lining and Anatomically designed insole provides a high level of comfort and moisture control. IdCell: Heel area consists of a very soft sponge EVA midsole and perfectly absorbs impacts and shocks when the heel strikes the ground. Outsole is Resistant to Oils, Acids and Alkalis and heat contact up to 300ºC. Conform to: EN 20345 S1-P SRC. Puma Omni Sky Low Safety Shoe comes with impact and compression resistant synthetic toe cap. Unique combination of strong suede and textile inserts increases this uppers breathability and resistance. BreathActive multi layered lining provides moisture management and great breathability. Ergonomically shaped footbed provides optimum support, with a cushioning hell pad to absorb impact. Flexible and lightweight PU sole with abrasion resistant finish and ergonomically shaped footbed provides optimum support with a cushioning. Puma Safety Celerity Trainer with impact and compression resistant steel toe cap. Puma Safety shoe with high heat resistance - to 300 degrees. SRC - Slip resistance on both ceramic and steel surfaces covered with water and cleaning products. FAP midsole - made from ceramic-coated fibers, flexible anti penetration midsole. Ultra lightweight EVA midsole offers optimal cushioning and improved flexing. Puma Safety Omni Flash Low Safety Trainer with Leather & Textile composition. Lightweight midsole is both penetration resistant and shock absorbing, antimagnetic synthetic protective toe cap. Anti-static and energy absorbing heel, penetration resistance 1100 Newtons. Ergonomically shaped Puma Safety Omni Flash Low footbed provides optimum support to the foot. BreathActive lining provides great moisture management and extra breathability. Puma Safety Atomic trainer comes with Water-resistant leather upper. Lace up Safety Trainers with anti-static and energy absorbing heel. Synthetic, antimagnetic protective toe cap with thermal insulaton and lightweight midsole is both penetration resistant and shock absorbing. Slip resistance standard SRC – standard for anti-slipping on both ceramic and steel surfaces covered with water and cleaning products. Ergonomically shaped footbed provides optimum support to your foot. Advanced work boot made using oiled nubuck leather, which has the same velvety character as nubuck leather, but is smoother and offers more protection against moisture penetrating. The hard-wearing honeycomb structure of the iCell element improves the cushioning while enhancing the shoes stability, guidance and comfort. Constructed with non-metallic components, the boot is scanner-safe and Electro Static Dissipative (ESD). Water resistant oiled nubuck leather upper. BreathActive functional lining moisture wicking. High tech fiberglass toe cap protection tested to 200 joules impact. Flexible anti-penetration midsole made from ceramic-coated fibres tested to 1,100 Newton. Anatomically designed footbed provides a high level of comfort and moisture control, giving a pleasant foot climate. Double density PU sole natural FLEXMOTION with iCELL element, very flexible, extreme cushioning and slip resistant. Puma Krypton Metal Free ESD Safety Boots conforms to: ISO 20345 S3 SRC ESD. Advanced work shoe made using the ultra-flexible SAFETY KNIT textile fabric perfectly adapts to the foot and fits like a sock. Constructed with non-metallic components, the boot is scanner-safe and suitable for metal-free work environments. This vegan-friendly model is free from any animal content including glues/adhesives which are made with resins. Rubber outsole with its differently shaped profile elements offers optimal mobility and safe contact with the ground. Heat resistant to 300°C contact. Puma Xelerate Knit Metal Free Safety Trainer Shoes conforms to: ISO 20345 S3 SRC HRO. A safety trainer that fuses together all round protection with the latest technical specifications of high-end sport runners. Featuring a combination of mesh and TPU, the upper has no stitching in the flex zones resulting in more comfort and durability. Excellent arch support, torsion control, duoCELL shock absorption and non-metallic hardware, for a shoe that is light, flexible and scanner-safe. Breathable textile with FUSE.TEC® TPU elements upper. BreathActive Functional Lining: Micro-Channel Mesh breathable lining. Composite Toe Cap Protection to 200 joules impact. Flexible FAP™ Midsole Penetration Resistant to 1100 N.
Evercushion® Ergonomic Shaped Removable Footbed. Exclusive duoCELL heel energy absorption system. Dual density EVA/Rubber outsole MOTION with Torsion Control System, 300°C heat resistant. Puma Fuse Motion Red Men Safety Trainer conforms to: ISO 20345 S1-P HRO SRA. Here you can find a range of high quality safety gear from one of the greatest brands out there Puma. Puma manufactures some of the best clothing items around and here you can find some of their best products. All of Puma?s products are designed with comfort in mind this is very easy to see when looking at the Puma Amsterdam. These boots are perfect for all jobs that require that extra protection. With an aluminium toe cap for maximum protection, this choice in materials also allows this boot to be lightweight. All of the safety footwear in this category are manufactured with durable, high quality materials to ensure a long lasting product life.